I’ve enjoyed commuting in Washington, D.C., because it has helped me learn new things about my country without really trying. Now that I have my National Parks Passport, I’m even more incentivized to learn about the historical landmarks and memorials around town. 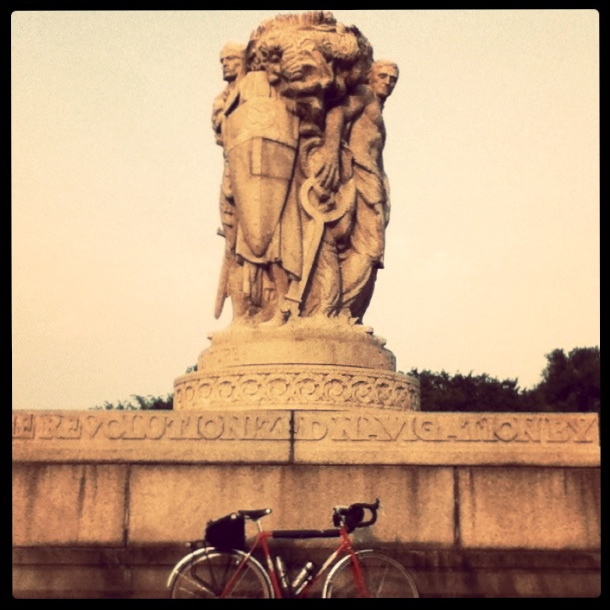 For example, my ride takes me by this beautiful memorial almost every day. I needed to take a picture of my bike in front of it. In addition, a helpful volunteer from the National Park Service told me that it was one of the go-to spots in my National Parks Service Passport. Perfect! 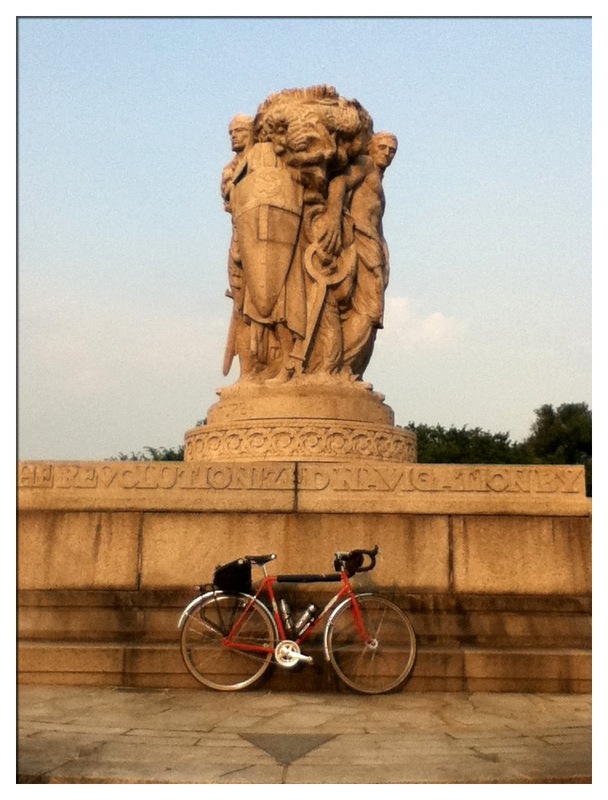 Good brevet training, as I get to ride to a particular place and get a stamp for it! This memorial, located squarely in the middle of the northern-most part of Ohio Drive, looks particularly stunning in the morning and during the time when the sun is casting afternoon light over the Potomac. Something about the way the sun catches it. One day in the late afternoon, I popped off the road and rolled up to the memorial to get my touronneuring credit and to learn more about it. This is the John Ericsson National Memorial. It’s named after I forget who. Ha! John Ericsson, of course. Ericsson, a Swedish engineer, lived from 1803-1889 and was the inventor of the screw propeller. He also designed an armoured ship called the U.S.S. Monitor, for the Union to use in the Civil War. He later designed other naval vessels and weapons, including a torpedo! The Ericsson Memorial is made of granite, which I probably should have known, since I did take geography in both high school and college. Like I said, the light catches it so nicely in the morning and afternoon hours. A bicycle? I’m more of a nautical man, myself. 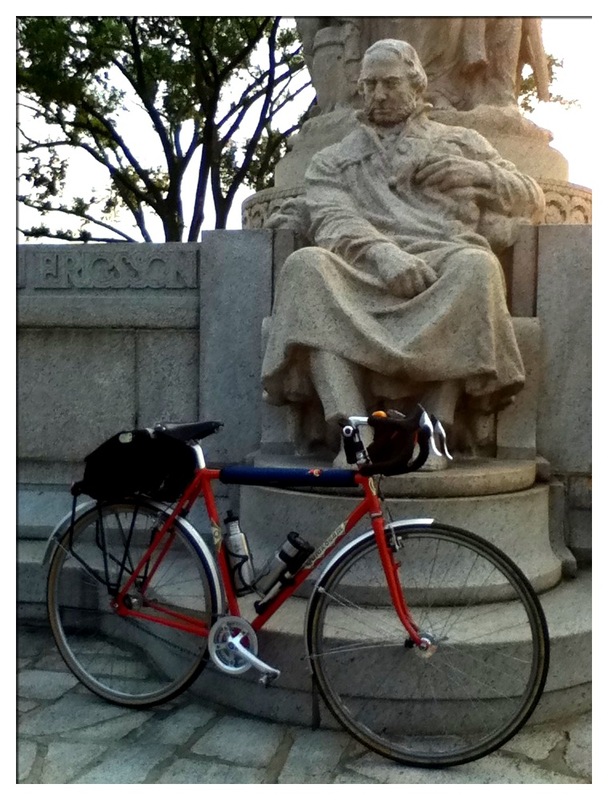 You should take your bike by there and get picture taken with the great inventor, John Ericsson. It’s a beautiful spot. I’d never even heard of this important historical figure. Thanks for the education Mary.